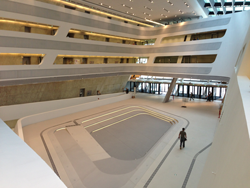 The brand-new WU Campus is the home of Vienna EUDC. Out of mere coincidence it opened its gates for members of the public for the first time literally just two days before the bid was ratified by Council. Out of mere coincidence of course, the Campus is painted in Vienna EUDC 2015 colours. The Vienna University of Economics and Business is the place where DKWien has been holding its regular Monday Sessions since its foundation. Since the old building, which also hosted 3 Vienna IVs, became too small for the ever-growing number of students, the university started building a new campus from 2009 on. 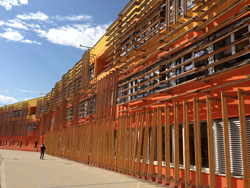 While the old one was located in the 9th district, in the north-west of the city, the new Campus is placed in the 2nd district in the north-east to the centre. It is surrounded by the Vienna Fair, Vienna’s conference area, the Prater, Vienna’s main recreational area, and an amusement park, called the Wurstlprater. The new location is only a block away from the Danube and due to its proximity to the Vienna Fair several hotels well-suitable for hosting the EUDC participants are located simply on the other side of the road next to WU Campus. A direct subway line connects the area with the city centre, which is only 4 stops away. Supermarkets, major restaurants and small shops are now reviving commerce in this neighbourhood.